Yeah, ok, so this may sound gross, but it’s a super delicious salad! I like to call this my Dump Salad because it’s loaded with wholesome goodies that are also leftovers from several other dinners cooked last week! :) You must try this and let me know what you think! Bacon Dressing: This is super easy to make – I like to cook my bacon slices on a roaster pan with slats in my oven so all the bacon drippings drip to the bottom pan. After I cook the bacon I reserve all the drippings and pour them into a sauce pan and add a little olive oil and balsamic vinegar and crumble 1 slice of bacon into the mixture. Heat until it boils and you are done! It’s amazing and tastes so good on the salad. A little goes a LONG way too! The salad is super easy to throw together, especially if you have made some of the other items days earlier for other recipes. I like to use bacon in a lot of recipes, so I’ll cook up a whole package and try to use the rest throughout the week when I need an extra crunch. We also keep a lot of hard-boiled eggs on hand for the whole week to grab as a quick protein packed snack and my kids love them in their lunches. The red potatoes are a regular side item in our house for dinners, so I just usually make a little extra any time I make them so we can use them in this salad, or as a side along with scrambled eggs for breakfast in the morning. 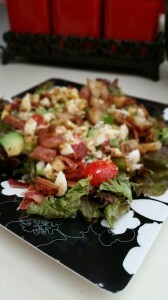 When all these things are on hand, this is a really easy lunch salad to throw together! Keep in mind, you can “dump” other things on this salad from your leftovers, some sliced chicken, or ham, might be really nice. You can also experiment with different cheeses, like feta and maybe some olives and pepperoni slices would be yummy as well. 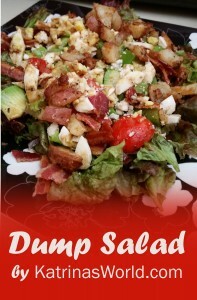 There are so many ways you can go with this idea of a Dump Salad, so have fun and experiment! Hope you love it as much as I do! Try it out and let me know what you think, and let me know if you made any substitutions! I’d love to know what combination of ingredients you like best! Hugs! Combine all the dry ingredients and stir with a big spoon in a large bowl. Mix the wet ingredients in a different bowl and I like to heat it up in the microwave for 30 seconds, it helps them mix up better. Then stir the wet ingredients in with the dry ingredients. I like to use my hands to mix it up well! 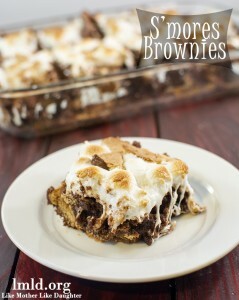 Then pour into 2-4 bar pans and bake for 30 mins at 375 degrees. 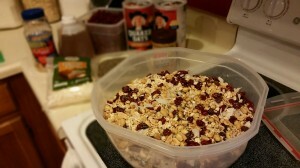 Make sure to stir your granola after it has cooked for 15mins. Once baked, let sit out until it completely cools. I then put my granola in a big cereal tupperware bin I have. 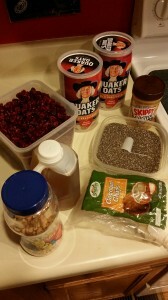 This makes a decent amount of granola – but for my family of 5, it usually lasts about 2 weeks at the most! Makes for a great breakfast meal or for a snack! You could also subsititute the honey with apple juice, or even orange juice – but it won’t come out as sweet. I’ve added chocolate chips by the handful (after it’s cooked of course) for a sweet treat late at night, and I’ve also used different types of nuts like cashew, walnuts, etc. You can leave out the coconut, but I love how it tastes. 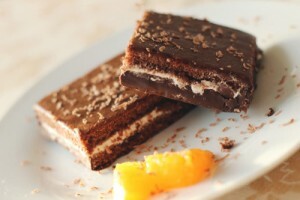 I like to use the big shreds of it that I found at Sprouts (which has not added sugar).